Opera nights are always a time to pamper myself and all my senses, and not even think about what I choose to eat. They are feasts for the eyes, ears, and taste buds. A night at the Lyric is a total experience, worthy of dressing up. “Yes,” we say and he punches the button for the third floor. As the door slides closed and the elevator begins moving, he tells us about the specials on the menu for the evening. Sometimes it’s Beef Bourguignon with a side salad and macaroons, or it could be Roast Duck with a delectable sauce to keep it moist, with a side salad or perhaps a potato. Each special has a name having to do with the opera: The Beef Bourguignon was called “La Bohème”. He also tells us the price: $25.00. We never order the specials, but it’s fun to hear about them anyway. When the elevator door opens on the third floor, we go to the reception desk and are efficiently escorted to a tiny round brown and white marble-topped table already set with silverware, rolled white cloth napkins, and inviting glasses of ice water. The walls are filled with photographs of past Lyric productions of various operas. In one area of the restaurant, there is a glass case featuring the elegant gown worn by the lead female performer of a recent opera. This is always an elaborate costume, and gazing at it I always wonder how heavy and hot it must be, yet how the performer wears it with such apparent ease and grace as she moves about the stage singing her role. We order from the regular menu, which consists of entrée salads, sandwich trios, filled pastries and a few other choices, all printed on one side of a narrow menu. The other side of the menu contains the wine list. We don’t generally order wine, because we want to stay awake for every beautiful moment of the opera. The coffee, however, is quite good: strong yet smooth, regular or decaf – they both taste the same. Tea and soda are also available. Occasionally my friend will order a glass of wine, and if she does, I might too. 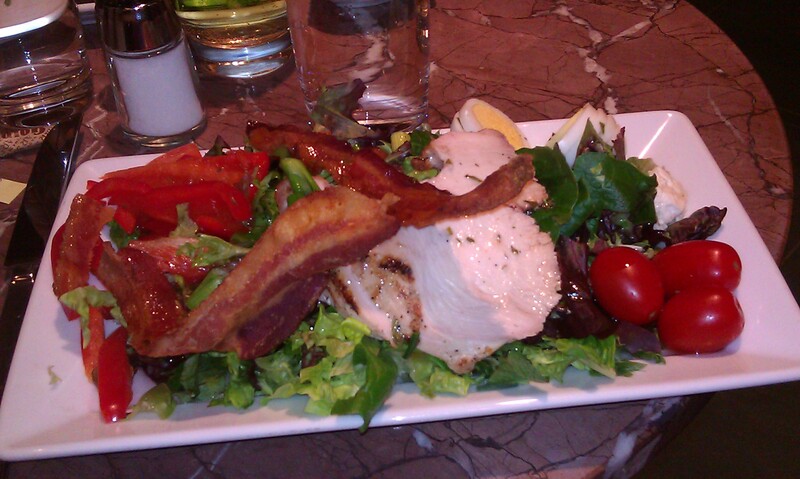 Cobb salad – my entree at the Bistro before Lyric Opera performance of La Boheme. Even though the portions are not large, the food is filling and always enough. Of course the restaurant would not want to encourage their patrons to take leftovers – imagine the smell of all that food in the auditorium! However, we do partake in a special treat: We order a dessert from the dessert menu, which will be ready and waiting for us when we come down at intermission. It is usually about 6:30 when we are finished eating, ordering dessert and paying for our meal, and we take the stairs back down to the first floor, where there is a pre-opera lecture, at which we are told the story and background of the opera we are going to see, interspersed with snippets of arias, musical themes, or dramatic instrumentals. Programs in hand, we then head back upstairs – and we generally take the stairs, mindful of getting some exercise – usually our seats are four flights up, to the back of the first balcony, the cheapest seats, but by no means a lesser experience. The acoustics at the Lyric are absolutely wonderful, and if we cannot see the expressions on the characters’ faces, we take out a pair of small binoculars that fold up into a pocket-sized case to get a closer view. This has to be well-timed, however: generally the opera is sung in Italian, German or French, and I don’t want to miss the supertitles in English projected above the stage. That is why I try to plan my binocular use to moments when the singers are repeating the same line of text and I don’t have to read a translation of what’s being sung. Before the opera starts, I read about the first act, or whatever comes before the intermission, usually while I am in the ladies’ room. You cannot leave while the opera is being performed because they will not let you back in until the intermission or an interval between acts, so it’s best to get this necessity out of the way beforehand. Just before the performance begins, everyone is reminded to silence their “mobile communication devices”. Even so, sometimes someone suffers the mortification of having their phone ring, the ringtone usually in embarrassing dissonance with the music. People glance around to figure out where the sound is coming from and generally discover someone frantically groping for their phone in order to turn it off or subtly pushing it with their foot farther under the seat to muffle the sound until it stops ringing, while those around them glare at them with irritation. scenery which will be used for much of the opera. Sometimes it is somewhat plain, but often it is elegant and dramatic, complimenting the mood and setting of the opera. I remember one opera, Eugene Onegin, in which the entire stage was covered with brilliantly colored autumn leaves, through which the characters moved about, as a few leaves fell around them, covering the spaces they invariably made with their footsteps. Another took place at a dye factory and from the upper balcony, we could see vats of colored “dyes” (probably paint) in rustic hues of red, orange, yellow, brown and blue. I often think that the balcony has a better view of the stage because we are looking down on it and can see the entire layout. Those on the main floor see the characters closer up, but miss some of the spectacular scenery laid out on the stage. Now comes the real treat: the feast for the eyes and ears. 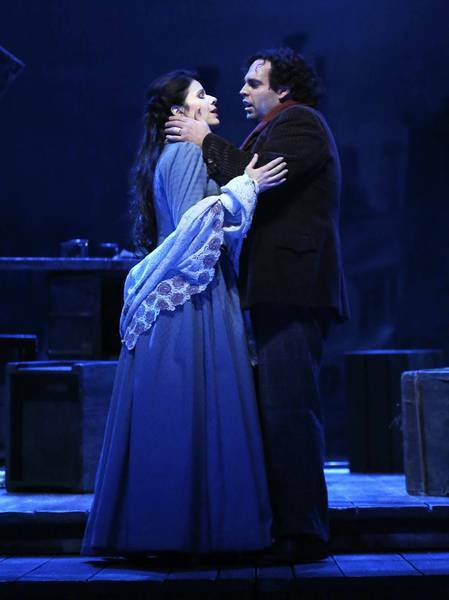 Glorious music enfolds us and we are drawn in to the scene on stage, feeling the emotions of the characters through the soprano’s exhilarating high notes, the bass’s impressive low notes, and the intricate harmonies of the soprano’s and tenor’s love duet. The color, the dramatic ups and downs of the music, the palpable excitement of the singers as they sing their arias, duets and trios – it’s an incredible, enticing show. Finally the curtain goes down at the intermission and we quickly get up, leaving our coats, binoculars and other unnecessary items at our seats, and head back down to the Bistro. 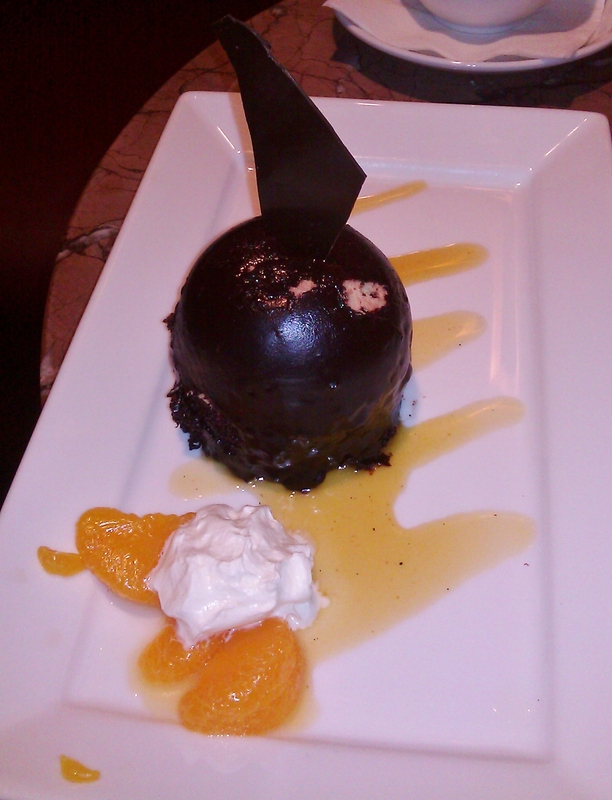 called Freud’s Fantasy (topped with a long, slender cookie that looks quite phallic); a flourless chocolate cake; a chocolate mousse dipped and covered in chocolate and caramel, and topped with a chocolate wafer; an apple crisp; or if you want to watch your weight, a fruit plate or a serving of macaroons. I take a picture of my dessert with my cell phone and post it on Facebook with a caption indicating what opera we are experiencing. Intermission is usually 25 minutes, and how quickly it goes! We have already paid for our dessert but we barely have time to finish before we hear a series of bell tones, indicating 10 minutes, then 5 minutes, to curtain time. I rush to the washroom – by now there is no line out the door – and we always manage to get back to our seats in time. My friend was told to bring tissue to La Bohème – it is a tearjerker, and no matter how implausible, the stories of the operas always draw me in and I feel everything I’m supposed to feel. Often operas end with someone dying or some kind of tragedy. Somehow the emotion of this type of ending stays with me the longest, the mood lingering on the Metra ride home, and throughout the night. Every time I wake up during the night, I remember the music, the story, or the mood of what I’ve seen the night before. I can still taste the experience the next morning or long afterward as the aria melodies replay in my head, until they fragment into forgetfulness. No matter what I’ve forgotten, I know that soon I will have another thrilling experience to look forward to: the next time I attend a Lyric Opera performance. Oh my husband would love you!! How he wishes I liked opera more. Too many 22 hour Wagenerian ring cycles for me. Sounds like a wonderful night though and the dinner/dessert looked beautiful…..
PreviousThe Daily Post: To go or not to go?